This year Monsoon is expected to hit Uttar Pradesh around 15th June 2018, as Monsoon arrived three days early this year in Kerela from its expected date of 1st June. If its current velocity continues it will hit the state of UP around mid-June and will cover the entire state till June 20 to June 25, 2018. 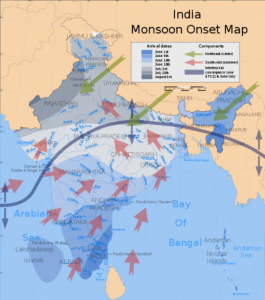 The coastal cities of India are already under the influence of Monsoon. States like Kerela, Karnataka and Tamil Nadu is already receiving thunder storms and rainfall. Not just in UP but whole of India is likely to receive normal rainfall during the four months of the southwest monsoon season this year, the India Meteorological Department (IMD) officials said on Wednesday. According to the IMD, the monsoon has so far covered entire Kerala and many parts of Karnataka and Tamil Nadu. The conditions are favourable for further advancement of monsoon into northeastern states by Friday. After making its early arrival in Kerala on 29th May, the monsoon is now advancing toward Karnataka, parts of Tamil Nadu and is expected to hit Andhra Pradesh and Telangana around 3rd June. Maharashtra and Goa could experience early rains from 6th June. It is to be noted that thunderstorms and heavy rainfall had already killed over 150 people in the states of Bihar, Jharkhand and Uttar Pradesh on Tuesday, 29th May 2018. In the earlier months many Indian states were hit with sudden storms and rainfalls which caused major damage to life and property. As the monsoon is considered the ‘lifeline’ of the Indian agriculture, the farmers and agriculture of the country will benefit greatly with the early arrival of monsoon in the country, it can lead to a bountiful harvest of the crops. The IMD said North-west India, comprising key kharif-crop producing states such as Punjab, Haryana and western Uttar Pradesh, is likely to receive higher rainfall than last year. The June-September, 4 months monsoon season is considered extremely important not only for the kharif crops, but also for the Indian economy, which is largely dependent on the agriculture sector. Normal rainfall could boost the crop production and in turn it would boost the Indian economy as it makes way for better farm output and boost consumer demand.